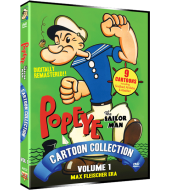 This special edition contains 9 Popeye cartoons from the ‘classic’ Fleischer period, including the three Fleischer ‘Color Specials’ (SINDBAD, ALI BABA and ALADDIN). In November 1932, King Features signed an agreement with Fleischer Studios to have Popeye appear in a series of animated cartoons. 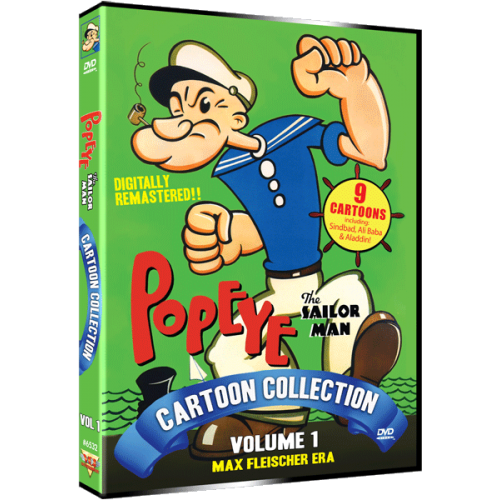 The first cartoon in the series was released in 1933, and Popeye cartoons, released by Paramount Pictures, would remain a staple of Paramount's release schedule for nearly 25 years. Thanks to the animated-short series, Popeye became more of a sensation than he had been in comic strips, and by 1938, the sailor was Hollywood's most popular cartoon character. Fleischer Studios produced 108 Popeye cartoons, 105 of them in black-and-white. The remaining three were two-reel (double-length) Technicolor adaptations of stories from the Arabian Nights billed as "Popeye Color Features": Popeye the Sailor Meets Sindbad the Sailor (1936), Popeye the Sailor Meets Ali Baba's Forty Thieves (1937), and Aladdin and His Wonderful Lamp (1939). All cartoons have been digitally restored and remastered from the best 35mm and 16mm film materials available.